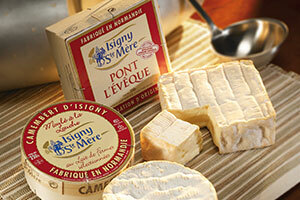 Isigny Sainte-Mère cheeses all share the taste of the terroir and the passion of the master cheesemakers who make them. They bring together rich and rare milks and careful masters of their art whose painstaking work ensures the continuity of the exceptional taste of Isigny Sainte-Mère cheeses. 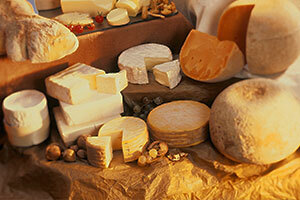 They are the products of traditional know-how that has been enriched down the decades. Tended in our own ripening chambers, Isigny Sainte-Mère cheeses are the products of choice, whether for everyday consumption or for cheese boards on special occasions. This excellence can be recognised by official quality marks: the Isigny Sainte-Mère cooperative is proud to offer two PDO cheeses, the PDO Normandy Camembert and the PDO Pont l’Evèque, as well as two Label Rouge Mimolettes, the Mature and the Extra Mature.
. Soft cheeses with mould rinds, such as Camembert or Pont l’Evèque.
. Fromage frais: smooth or set, with fruit or plain. An experienced master cheesemaker, who has worked in many different ripening chambers, Bruno has been looking after Isigny Sainte-Mère’s soft cheeses for six years now.